Like King, the organizers of the Million Worker March advance the proposition that “profit motives and property rights” have prevented the U.S. from making the transition from a “thing-oriented society to a person-oriented society.” Their subsequent demands for everything from universal healthcare and a living wage to progressive taxation and a slashing of the military budget call into question the fundamental assumptions upon which the American political economy rest and reflect a determination to advance the Constitution’s concept of equality to its logical conclusion. Critics of the Million Worker March and of progressive politics generally scoff at the notion of investing tax dollars in social welfare programs. They say that such programs will dilute the work ethic and make people lazy and complacent. This argument rests upon the assumption that all rich people have worked hard to become wealthy, and anybody who works hard can become rich. This is an admittedly tantalizing proposition, and it lies at the very heart of the American dream. Unfortunately, economic data from the past 30 years show that the American dream is fast fading for 95 percent of the American public, as the top 5 percent of the population acquires a larger and larger share of overall wealth. In a society where the top 1 percent owns about one-third of the nation’s wealth, it is far likelier that those who are already rich will simply maintain or increase their wealth through inheritance, while those who wish to become rich through hard work will wind up having to work harder just to maintain their place. It is within this context that calls for a more equitable distribution of wealth are justified. Critics of “social engineering” may argue that ordinary citizens already pay enough taxes to the federal government. This is true. Thanks to the various loopholes, tax shelters, and accounting schemes that exist to help the wealthy avoid paying their fair share, U.S. taxpayers who earn below $200,000 a year have gradually assumed a greater share of the tax burden than higher-income earners. According to New York Times financial writer David Cay Johnson, the author of Perfectly Legal: The Covert Campaign to Rig Our Tax System to Benefit the Super Rich and Cheat Everybody Else, in 1992 the top 400 income earners in the U.S. paid 26 cents of every dollar to the IRS, while the remainder of the population (i.e., the working class) paid 13 cents. In 2000 the top 400 continued to lighten their load, paying 22 cents on the dollar, while everybody else wound up subsidizing members of the leisure class to the tune of 15 cents on the dollar. The recent Bush tax cuts, Johnson says, have resulted in a situation where the wealthy are now taxed at only 17.5 cents on the dollar. A General Accounting Office (GAO) report in April 2004 confirms this trend. The study found that more than 60 percent of the largest corporations in the U.S. paid no income taxes between 1996 and 2000. For the sake of comparison, corporations paid 24 percent of all federal taxes in 1960, 15 percent in the 1970s, 12 percent in 1996, 8 percent in 2002, and 7.4 percent in 2004. This situation has come about because of lax enforcement by the IRS, where audits of the nation’s largest corporations declined by about 50 percent during the 1990s, and because of legislative policies that favor corporate interests and the leisure class over the working class (i.e., ordinary citizens). Such developments obviate the inclination of even the most “rugged individual” to dismiss the Million Worker March as irrelevant to all but the poor. Although taxes are universally despised, they are nevertheless absolutely essential to the fabric of a modern democratic society. They pay for everything from national defense to the stop sign on the corner block and everything in between. Their timely and honest payment is not only a civic duty but a patriotic one, since taxes are investments in the present and future direction of American society. Asking the wealthy to pay a greater proportion of taxes than the working class is not only fair, but it is an opportunity for members of the leisure class to demonstrate their gratitude to the society that has allowed them to become rich in the first place. Logically, then, those who attempt to shirk this most vital of civic responsibilities are clearly uninterested in supporting democratic society in general or American society in particular. Beyond the issue of patriotism, though, is the question of fiscal responsibility. Allowing big business and the wealthy to avoid paying their fair share to the IRS has resulted in record budget deficits at the federal, state, and local levels. The nonpartisan Center on Budget and Policy Priorities (CBBP) has estimated that state governments face a combined deficit of $70 billion to $85 billion in 2003-2004 as a direct result of tax evasion schemes in which corporations divert royalties and other payments to out-of-state or offshore holding companies. Meanwhile, at the federal level the Congressional Budget Office (CBO) has forecast a $3 trillion budget deficit over the next 10 years with a $422 billion shortfall in 2004 alone. This state of affairs is so alarming that International Monetary Fund (IMF) officials are calling on Washington, D.C. to quickly reduce the nation’s share of external debt, which currently stands at about 40 percent of the U.S. economy, by raising taxes and reducing spending in order to protect the health of the global economy. They say that such a deficit is “unprecedented. . .for a large industrial country.” Combined with an ever increasing trade deficit and a weakening dollar, the gigantic budget deficit in the U.S. could result in a worldwide recession as interest rates escalate. To make matters worse, much of the tax revenue that is collected from ordinary U.S. citizens is often misspent or wasted. On September 10, 2001, Donald Rumsfeld revealed that $2.3 trillion or 25 percent of the yearly Pentagon budget had gone unaccounted for. Factor in the astonishing growth in military and homeland security spending that has taken place over the last three years (180 percent and 53 percent respectively), and it is clear that U.S. taxpayers have been subsidizing the activities of private companies in the industries of aerospace, defense, and weapons manufacture for some time now. On the other hand, if the amount of money that is routinely channeled to the Pentagon were more equitably distributed for programs and services such as affordable housing, public education, job training, public transportation, universal healthcare, childcare, mental health and drug treatment programs, etc. the U.S. would be well on its way toward eradicating poverty, homelessness, hunger, substance abuse, illiteracy, ignorance, and many of the other ills that plague modern society. To the extent that tax dollars are used to furnish tangible public benefits, popular support for their increase will be forthcoming. As it stands, though, relatively few public benefits have accrued to ordinary citizens over the past 30 years, as the bulk of their tax dollars have been swallowed up by military spending. Given this situation, it is no surprise that the mere mention of tax increases often gives ordinary citizens fits. 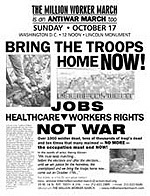 The organizers of the Million Worker March will attempt to make this and other arguments, as it merges the 42,000-member ILWU with trade union federations from around the country in a coalition that includes anti-war and community groups, religious organizations, and unorganized workers irrespective of race, religion, or party affiliation. The event promises to be another class-based affair with one important difference. This time, workers of all stripes (blue, white, and pink-slipped) are invited to participate. By broadening the definition of working class to include middle income white collar workers, liberal or otherwise, organizers hope to avoid the missteps of the 1968 PPC. If successful, the Million Worker March could serve as the basis for a larger social movement that, with the appropriate strength and commitment, could realize the true potential of Dr. King’s dream: a society wherein people are judged by the content of their character and not by the color of their skin. The subtext of King’s dream, of course, is that individuals will only be free to be judged by the content of their character insofar as the socioeconomic differences that exist between them are eliminated.